A new Erasmus+ KA2 project on Strategic partnerships for Adult Education has started. ALL DIGITAL is the coordinator of the project OPEN-AE: Promote Open Source Technologies in non-formal Adult Education, which will be implemented with four other ALL DIGITAL member organisations. Open-AE was awarded through EPOS, the National Agency for Erasmus+ programme in Flanders. The project will promote open source technologies in non-formal adult education to support the digital upskilling of both educators and learners. Its aim is to build capacity of non-formal training organizations, such as digital competence centers, to deliver high quality and relevant digital skills training to adults by improving staff competence on open source technologies. The project objective is to improve teaching and digital skills of e-facilitators through a modular blended course on open source technologies. Open-AE will promote access and learning through Open Educational Resources (OER). It includes the generation of open educational content on open source technologies, using open technologies for its production. It will promote open access to such content through a modular blended course (on-line and f2f seminars) and the generation of such content by the participants (e-facilitators) through work projects on open source technologies, as part of their training. Digital Competence Framework for Educators (DigCompEdu) will be adopted to map the Open-AE course curriculum. Specifically, 10 e-facilitators will be trained in each project country on open source technologies through the Open-AE modular blended course. This will lead the creation of sustainable communities of practices around open source technologies, which will facilitate outreach to other educators, adult users and stakeholders across Europe. 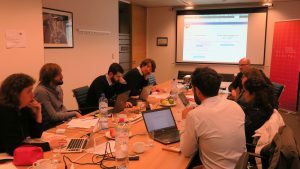 The project was kicked off in Brussels on 12-13 December 2018 at the ALL DIGITAL office. 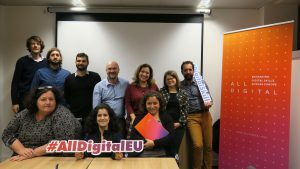 As the project started already on 1 November, partners had previoulsy met at the ALL DIGITAL Summit in Brussels and held an online meeting to start activities. The kick off meeting then focused on preparing the Open-AE curriculum. To do so, partners will research and prepare national reports for participating countries and one European report on the state of open source technologies in non-formal education. Partners will also hold focus groups with e-facilitators to understand their needs. Together the information from the national reports and focus groups will develop the backbone of the Open-AE training curriculum. The training curriculum will then be piloted in all participating countries on 10 e-facilitators. In total 40 efacilitators will be trained. the need to use standardised frameworks like DigComp and DigCompEdu. address adult trainers working in the non-formal educational sector to reinforce digital skills and competences. To achieve this end, OPEN-AE will adopt the DigCompEdu in the develop of its training curriculum. Colectic – a Spanish non-profit organisation working in fields related to community networks and technology. It promotes the use of open technologies to improve the situation of communities and citizens’ groups, with special attention to the weakest groups (NEETs, unemployed people, women, migrants etc. ).